Pros and cons define and differentiate the most popular fence types chosen by homeowners today. A fence introduces not only privacy and security to your property, but it can also enhance curb appeal and safely corral your pets and kids. If you plan on building a fence, the logical place to start is by exploring popular fence materials. Wood—the stuff of classic picket fences—is easy to work with and long lasting, but if painted or stained, it requires regular maintenance. Lower-maintenance options include vinyl, or PVC, as well as sturdy composites—a greener, though pricier, alternative. Metals like coated aluminum and chain link need little upkeep, but the downsides are that aluminum can be lightweight, and chain link, well, it can be an eyesore. Whatever the material, you’ll find a range of fence panels in a range of designs to suit a variety of tastes, purposes, and architectural styles. There’s much to recommend vinyl fencing. It is manufactured in a range of styles, with decorative post caps to match, and there’s now a greater variety of colors and finishes to choose from. Perhaps the most appealing aspect is that you do not need to repaint vinyl. A hard-wearing material, it won’t warp, splinter, rot, split or blister. And it’s easy to clean; dirt can be washed away using only a sponge and hose (or a pressure washer). Though vinyl may initially cost more than wood, it’s less expensive over time. There are of course negatives to be aware of. Dozens of styles are available, but design options are not unlimited with vinyl fencing, and its plastic appearance is not everyone’s favorite. It’s tough stuff, to be sure, but vinyl can break—under high winds, for example, or upon impact from a well-struck soccer ball. Minor damage (holes, cracks, and so on) is repaired with body filler followed by sanding and re-painting. More extensive damage may require a replacement component, so if and when you install vinyl fencing, hang on to any spare parts. If your fence style is discontinued, that could mean you’re out of luck. The construction of vinyl fencing is more complicated than might be expected. Rails are attached using specialized brackets or crimping tools, and posts must often be reinforced with concrete or metal stiffeners. Last but not least, it’s important to note that vinyl is generally considered environmentally unfriendly. Toxins are produced in its manufacture, and the material is difficult to recycle. Composite fencing (an engineered wood product) comes in a bewildering number of variations. Some fences have solid, not hollow, boards. Some are “capped” or “co-extruded” with a layer of PVC. And while multiple components are often required, in some cases construction is similar to that of a wood fence. Common to all is the fact they are made with recycled fibers, plastics, and binding agents. Due to manufactured textures and colors, composite fencing simulates wood more effectively than vinyl does, but if you opt for a solid color, there are fewer choices among composites. Like vinyl, composite fences require no staining or painting, and their low maintenance requirements can be easily taken care of—only mild detergent and a hose are needed for cleaning. Durable and often backed by warranty, composite fencing is assembled, not with special brackets, but with traditional fasteners. 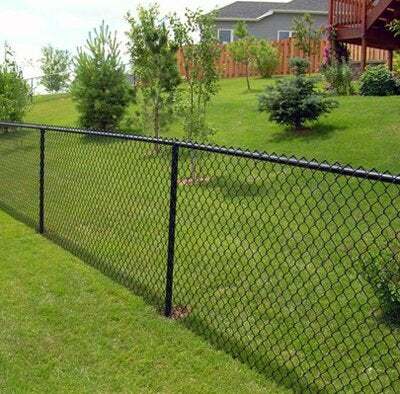 Another pro: Composite fencing is environmentally friendly. Up to 95 percent of materials used in its manufacture are recycled, and some makers employ a nearly waste-free manufacturing system. Unfortunately, however, composite products cannot be recycled easily. Compared to vinyl or wood, fewer styles are available with composite fencing, whose designs are mainly limited to fence types that involve boards—privacy, shadow box, and post-and-rail fences, not to mention those with simple dog-ear pickets. Another con is that composites are susceptible to scratching, staining, and fading. Cost? Composite boards go for about twice as much as pressure-treated wood, and between the two, wood is easier to work with. 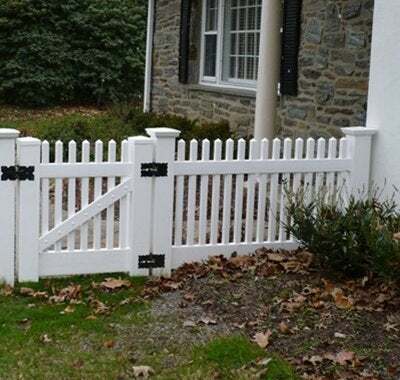 Wood fences have been a mainstay of the American landscape since Colonial days. They can be crafted in a wide variety of styles and painted or stained with innumerable colors. In some regions, cedar and redwood are the preferred material on account of their resistance to rot and insects, but several other wood species are also used. For longevity, pressure-treated wood is best, at least when it comes to structural members. Any non-pressure-treated pickets or boards should be coated with a preservative prior to finishing. Initially, wood costs significantly less than either vinyl or composite, and if properly constructed and maintained, a wood fence will last for many years. And unlike petro-based materials, wood is renewable if sustainably harvested. On the other hand, wood requires more maintenance than other materials. A couple of times per year, it should be rinsed off, and every three or four years, it should be repainted or finished with a stain. Cedar and redwood fencing may be left to weather naturally, but even so, a clear preservative should be applied every few years. Because of the additional maintenance required, the cost of wood fencing may ultimately equal or exceed that of other fence types. In many ways, ornamental metal fencing combines the best qualities of other materials. Available in a wide variety of styles, it’s very low-maintenance and unsurpassed in durability. While cast iron was the norm for many decades, today’s standard is powder-coated galvanized steel, aluminum, or a combination of aluminum and solid metal. Maintenance is limited to an occasional hosing. If rust appears, it can be brushed off, or the metal can be treated with a rust-inhibiting primer and a fresh coat of paint. Even after many decades, metal fencing can easily be recycled. Ornamental fencing is not without drawbacks. For one thing, repair work can be tricky. But metal fences are highly resistant to damage. Indeed, you can buy Civil War-era cast iron fencing that has outlasted the house it once surrounded. Chain-link is sturdy, maintenance-free, durable and economical, plus it’s ideal for situations in which you want your fence to be see-through (burglars cannot hide behind chain-link, after all). Installation is easy. Most of the fittings are tightened down with a socket wrench. The only special tool you may need is a second pair of hands to assist in pulling the mesh tight. Since it’s often possible to re-stitch damaged mesh fabric, repairing a chain-link fence is relatively easy. Inevitably, chain-link fencing possesses a utilitarian aesthetic, but style options exist. Different mesh sizes and wire gauges are available, and the polymer coatings now come in colors, such as brown, green, and black—any of these provides a softer look than silver. When installed among shrubs or along the border of wooded areas, it’s possible for a chain-link fence to be nearly invisible, especially if outfitted with fabrics or lattice panels.